The oldest state flag still in use is Denmark's 13th century Dannebrog. A flag is a piece of cloth, often flown from a pole or mast, that is generally used symbolically by a nation, state, or organization, however flags are multi-purpose and can be used for messaging, advertising, signaling, religious ceremony or simply for decorative purposes. The history of the flag dates back to at least Roman times. The study of flags is known as vexillology, from the Latin vexillum meaning flag or banner. National flags can be important patriotic symbols with varying interpretations from country to country, that resonate with feelings of identification from its citizens. Military, political and religious flags throughout history have been the inspiration for both positive and negative emotions and the desecration of such flags is usually looked upon as an act worthy of punishment. The world's largest flag is this 18,843 m² (202,823.55 ft²) flag of Israel. The first flags were used to assist military coordination on battlefields. Signaling, as such, has been very important in environments where communication is similarly challenging (such as the maritime environment where semaphore is used). Letter F of the nautical semaphore flag signaling system. Although flag-like symbols were used in some ancient cultures, the origin of flag usage in the modern sense is in question. Some believe flags originated in China, while others hold that the Roman Empire's vexillum or the Cyrus the Great's standard (a hawk) were the first true flags. Flags are also featured in the Indian epic of Mahabharata. Originally, the 'standards' of the Roman legions were not flags, but were symbols such as the eagle of Augustus Caesar's Xth legion. This eagle would be placed on a staff for the standard-bearer to hold up during battle. However, a military unit from Scythia had a standard of a dragon with a flexible tail which would move in the wind. Other legions copied this, and eventually all the legions had flexible standards; thus, our modern-day flag. During the Middle Ages, flags were used mainly during battles to identify individual leaders: in Europe these were the knights, in Japan the samurai, and in China the generals under the imperial army. As European knights were replaced by centralized armies, flags became the means to identify not just nationalities but also individual military units. Flags then held important strategic value and became objects to be captured or defended. Eventually these flags posed too much danger to those carrying them, and by World War I the carrying of a flag was abolished on the battlefields. From the time of Christopher Columbus, it has been customary (and later a legal requirement) for ships to carry flags designating their nationality. These flags eventually evolved into the national flags and maritime flags of today. Flags became the preferred means of communications at sea, resulting in various systems of flag signals. 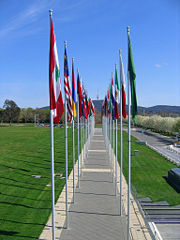 Many flags are displayed in the Parliamentary Triangle, Canberra, Australia. One of the most popular uses of a flag is to symbolize a nation or country. Some national flags have been particularly inspirational to other nations, or countries, in the design of their own flags. The flag of Denmark is the oldest state flag still in use. This flag, called The Dannebrog, inspired the cross design of the other Nordic countries: Norway, Sweden, Finland, Iceland, as well as regional flags for the Faroe Islands, Åland, and Scania. The Union Flag (nicknamed the Union Jack) of the United Kingdom formed the basis of the design of its colony's flags. Many former colonies have retained the design to acknowledge their cultural history. Such examples include: Australia, Fiji, New Zealand, Tuvalu, the Canadian provinces of Manitoba and Ontario, and the American state of Hawaii. The Tricolor of The Netherlands is the oldest tricolor, first appearing in 1572 as the Prince's Flag in orange–white–blue. The Dutch Tricolor has inspired many flags but most notably those of Russia, India and France, which spread the tricolor concept even further. 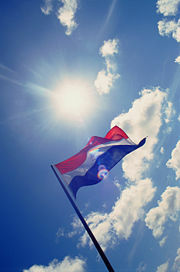 The Flag of the Netherlands is also the only flag in the world that is adapted for some uses; when an event has a connection to the Royal House of the Netherlands, an orange ribbon is added. The Dutch flag is the oldest tricolor. The national flag of France, also called the Tricolore, purportedly inspired other nations to adopt different tricolors in sympathy with the revolutionary spirit of 1794 when the flag was designed. Examples include: Costa Rica, Ireland, Italy, Romania, and Mexico. The flag of the United States, also nicknamed The Stars and Stripes or Old Glory is another example of a flag whose association with independence was emulated. In the same way that nations looked to France for inspiration, many countries were inspired by the American Revolution, symbolized by the flag. Examples are: Cuba, Liberia, Chile, Uruguay, and the French region of Brittany. The flag of Russia, the source for the Pan-Slavic colors has been adopted by many Slavic states and peoples. Examples: Slovakia, Serbia, Croatia, Slovenia. Ethiopia was seen as a model by emerging African states of the 1950s and 1960s, as it was one of the oldest independent states in Africa. Accordingly, its flag became the source of the Pan-African colors. Examples are Togo, Senegal, Ghana, and Mali. The flag of Turkey, which was the flag of the Ottoman Empire, has been an inspiration for the flag designs of many other Muslim nations. During the time of the Ottomans the crescent began to be associated with Islam and this is reflected on the flags of Algeria, Azerbaijan, Comoros, Malaysia, Mauritania, Pakistan, Tunisia, and of the Turkish Republic of Northern Cyprus. The Soviet flag, with its golden symbols of the hammer and sickle on a red field, was an inspiration to flags of other communist states, such as East Germany, People's Republic of China, Vietnam, Angola, Afghanistan and Mozambique. The flag of Venezuela, created by Francisco de Miranda to represent the independence movement in Venezuela, inspired the individual flags of Colombia, Ecuador and Bolivia. Three of them (Colombia, Ecuador, and Venezuela) share the colors, yellow, blue and red. German troops after surrendering to the U.S. Third Army in World War II. The first soldier carries a white flag. Some national flags have strong military associations due to their military uses. Several countries (including the United Kingdom and the former Nazi Germany) have their armed forces fly specially designed flags rather than the national flag. Other countries' armed forces (such as those of the United States or Switzerland) use their standard national flag. The Philippines' armed forces may use their standard national flag, but during times of war the flag is turned upside down. Large versions of the war flag flown on the warships of countries' navies are known as battle ensigns. During times of war, the waving of a white flag indicates surrender. Flag of the Philippines when not at war. Flag of the Philippines when at war. Note the reversed red and blue stripes. Flags are particularly important at sea, where they can mean the difference between life and death, and consequently the rules and regulations for the flying of flags are strictly enforced. A national flag flown at sea is known as an ensign. A courteous, peaceable merchant ship or yacht customarily flies its ensign (in the usual ensign position), together with the flag of whatever nation it is currently visiting at the mast (known as a courtesy flag). To fly one's ensign alone in foreign waters, a foreign port, or in the face of a foreign warship traditionally indicates a willingness to fight. This custom is still taken seriously by many naval and port authorities and is readily enforced in many parts of the world by boarding, confiscating, and/or enforcing other civil penalties. In some countries yacht ensigns are different from merchant ensigns in order to signal that the yacht is not carrying cargo that requires a customs declaration. Carrying commercial cargo on a boat with a yacht ensign is deemed to be smuggling in many jurisdictions. There is a system of international maritime signal flags for numerals and letters of the alphabet. Each flag or pennant has a specific meaning when flown individually. 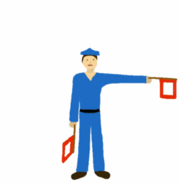 Additionally, semaphore flags can be used to communicate on an ad hoc basis from ship to ship over short distances. Since the early 1990s there has been an explosion of interest in decorator flags waving over homes in the United States. A new surge in popularity that has recently sprung up are garden flags, smaller (12 x 18 inches) flags that are placed on stands on the ground. Flowers, sports logos, animals, vegetables, patriotic designs, fish, sunflowers, tulips, hummingbirds, and pineapples (the Colonial sign of welcome) are among the hundreds of choices available to land and homeowners. Mildred Callahan Jones is credited with pioneering the decorative flag industry. She originally started making flags as a hobby after purchasing a piece of Scandinavian cloth in 1971 in order to guide party guests to her home in the Fan district section of Richmond, Virginia. Her interest in flag making turned into a small business after she hung a giant flag outside her home with the words, It's a Boy, announcing the birth of her son in 1975. Jones, and her idea for decorative flags, soon propelled her into the national limelight. Reporters from around the country, soon began arriving at her Richmond home in order to file stories on the "flag lady," as Jones became known. She founded her company, Festival Flags Unlimited Inc., The Original Decorative Flag, in 1977. Over the years Jones and Festival Flags produced thousands of flags and other related products. Her flags were used in a wide array of public events and venues around the world and beyond, including art exhibitions, colleges, churches, such as the Washington National Cathedral, museums, playgrounds and even several castles in England. Jones' flags were even carried into space onboard the Space Shuttle Discovery in 1985. Flags are usually rectangular in shape (often in the ratio 2:3 or 3:5), but may be of any shape or size that is practical for flying, including square, triangular, or swallow tailed. A more unusual flag shape is that of the flag of Nepal, which is in the shape of two stacked triangles. Common designs on flags include crosses, stripes, and divisions of the surface, or field, into bands or quarters. A heraldic coat of arms may also be flown as a banner of arms, as is done on both the state flag of Maryland and the flag of Kiribati. The flag of Libya, which consists of a rectangular field of green, is the only national flag using a single color and no design or insignia. Flags can play many different roles in religion. In Buddhism, prayer flags are used, usually in sets of five different colored flags. Many national flags include religious symbols such as the cross, the crescent, or reference to a patron saint. Flags are also adopted by religious groups such as the Jain flag and the Christian flag, representing Jainism and Christianity, respectively. Tibetan Prayer Flags, made in the Himalayas, promote peace, compassion and wisdom. It is believed the energy of the prayers and sacred mantras on the flags are blown in the wind and will bring Joy, Happiness and Good health to all who see them as well as their families, loved ones, neighbors, and all people throughout the world. Tibetan Prayer Flags are traditionally found on rooftops, mountain passes, river crossings, gardens and other sacred places in the Himalayas. Woodblocks are used to decorate the prayer flags with images, mantras, and prayers. Usually at the center of a prayer flag, there is an image of the Wind Horse which bears the Three Jewels of Buddhism. On the Four corners of each of the Prayer Flags, are images of a Garuda, Dragon, Tiger, and Snow Lion which are the four sacred animals representing the Four Virtues of Wisdom, Strength, Confidence, and Joy. Flags flown on a beach. Because of their ease of signaling and identification, flags are often used in sports. In Football (American) and Canadian football, referees use flags to indicate an error has been made in game play. The phrase used for such an indication is flag on the play. The flag itself is a small, weighted handkerchief, tossed on the field at the approximate point of the infraction. In American football, the flag is usually yellow; in Canadian football, it is usually red. In yacht racing, flags are used to communicate information from the race committee boat to the racers. Different flags hoisted from the committee boat may communicate a false start, changes in the course, a canceled race, or other important information. Racing boats themselves may also use flags to symbolize a protest or distress. The flags are often part of the nautical alphabetic system of International maritime signal flags, in which 26 different flags designate the 26 letters of the Latin alphabet. In auto racing and motorcycle racing, racing flags are used to communicate with drivers. Most recognized is a checkered flag of black and white indicating the end of the race, and victory for the leader. A yellow flag is used to indicate caution requiring slow speed and a red flag requires racers to stop immediately. A black flag is used to indicate penalties. In Association football (soccer), linesmen carry small flags along the touch lines. They use the flags to indicate to the referee either potential infringements of the laws, or to who possession of the ball goes after it has gone out of the field of play. Referees also raise the flag overhead to indicate an offside offense. Officials called touch judges use flags for similar purposes in Rugby. In addition, fans of almost all sports wave flags in the stands to indicate their support for the participants. Many sports teams have their own flags, and, in the case of international games like the Olympics, fans will indicate their support for a player by waving the flag of his or her home country. In Australia, New Zealand, the Philippines, and the United Kingdom a pair of red/yellow flags is used to mark the limits of the bathing area on a beach, usually guarded by surf lifesavers. If the beach is closed, the poles of the flags are crossed. The flags are colored with a red triangle and a yellow triangle making a rectangular flag, or a red rectangle over a yellow rectangle. On many Australian beaches there is a slight variation with beach condition signaling. A red flag signifies a closed beach (or, in the UK, some other danger), yellow signifies strong current or difficult swimming conditions, and green represents a beach safe for general swimming. In Ireland, a red and yellow flag indicates that it is safe to swim; a red flag that it is unsafe; and no flag indicates that there are no lifeguards on duty. Blue flags may also be used away from the yellow-red lifesaver area to designate a zone for surfboarding and other small, non-motorized watercraft. For safety, dive flags indicate the locations of underwater scuba divers. In water sports such as Wakeboarding and Water skiing, an orange flag is held in between runs to indicate someone is in the water. Railways use a number of colored flags. When used as wayside signals they usually have the following meanings (exact meanings are set by the individual railroad company): red = stop, yellow = proceed with care, green or white or blue = proceed, and a flag of any color waved vigorously means stop. A blue flag on the side of a locomotive means that it should not be moved because someone is working on it (or on the train attached to it). A blue flag on a track means that nothing on that track should be moved. The flag can only be removed by the person or group that placed it. Flags displayed on the front of a moving locomotive are an acceptable replacement for classification lights and usually have the following meanings (exact meanings are set by the individual railroad company): white = extra (not on the timetable),green = another section following, red = last section. Additionally, a railroad brakeman will typically carry a red flag to make his or her hand signals more visible to the engineer. At night, the flags are replaced with lanterns showing the same colors. Flag days are usually codified in national statutes, however, a decree by a head of state of the specific country can also consecrate a flag day. On this day the flag is displayed either at full or half mast. The locations of where the flags are flown (and how are they flown) can be also dictated by national law or decree. In the United States Flag Day is recognized on June 14th each year. The Pledge of Allegiance to the United States' Flag is an oath of loyalty to the country. It is recited at many public events. Congress opens each session with the recitation of the Pledge. A court case in 2004 challenged the constitutionality of the wording of the pledge of allegiance. The case had been brought by an atheist who did not want his third-grade daughter to have to listen to the phrase "under God" in the oath. The U.S. Supreme Court ruled that a California father could not challenge the Pledge of Allegiance, a decision that sidestepped the broader question of the separation of church and state. The 8-0 ruling by the high court reversed a lower-court decision that teacher-led recitation of the Pledge of Allegiance in public schools is unconstitutional. Social and political movements have adopted flags, not only to increase their visibility but to promote unity within their ranks. The socialist movement uses red flags to represent their cause. The primary flag to become associated with anarchism is the black flag. In the 1970s, the rainbow flag was adopted as a symbol of the LGBT social movement. Bisexual and transgender pride flags were later designed, in an attempt to emulate the rainbow flag's success. Some political flags have become national flags as was the case with the red flag of the Soviet Union. A flagpole or flagstaff can be a simple support made of wood or metal on which the flag is held in place by either a cord or a pulley. The pole is usually topped by a flat plate called a "truck" (originally meant to keep a wooden pole from splitting) or by a ball or a finial in a more complex shape. Very high flagpoles may require more complex support structures than a simple pole and may be built like a mast. 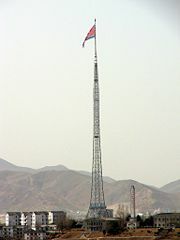 The highest flagpole in the world, at 160 metres (525 feet), is found at Gijeong-dong in North Korea. The flag weighs about 270 kilograms (600 pounds) when dry. The world's biggest regularly hoisted flag, however, is the Brazilian national flag flown in the Square of the Three Powers in Brasilia, the capital of Brazil. This flag weighs about 600 kilograms (1300 pounds) when dry and measures 70×100 meters (230x330 feet). It can be seen from all parts of Brasilia and its flagpole is the tallest structure in the city. The tallest free-standing flagpole in the world is the Aqaba Flagpole in Aqaba, Jordan, with a total height of 132 meters (430 feet). The Raghadan Flagpole, also in Jordan, is the second tallest free-standing flagpole in the world. It reaches a height of 126 meters (410 feet) and hoists a flag that measures 60 by 40 meters (200 by 130 feet). It is illuminated at night and can be seen from 25 km (16 miles) away. ↑ Since November 25th, 2007, according to Guinness World Records. ↑ Mildred Jones, 64; pioneered festive flags Missjaneys.blogsport.com. 2008. Retrieved May 7, 2008. ↑ Tibetan Prayer Flags-Tibetprayerwheels.com. Retrieved May 7, 2008. ↑ J. B. Calvert, Early Railway Signals, 2004 - Retrieved December 19, 2007. ↑ Flag Etiquette Usflag.org. 2005. Retrieved May 8, 2008. ↑ Court dismisses Pledge case CNN.com. 2004. Retrieved May 4, 2008. ↑ Joe Havely, Korea's DMZ: Scariest place on Earth CNN.com. 2002. - Retrieved December 19, 2007. Reproductions of Historical Military Flags and Colors- Dupagemilitaryflag.com. This page was last modified on 12 April 2017, at 15:48.